The Tigers will host the Eagles of Kamboi in their first home game of the season, and as a form of motivation ahead of Saturday’s clash, the club executive believes such a moral booster could spur the lads and technical team to secure their second successive victory in the league. According to the club’s media department, such a move from the executive was to keep the momentum of the players going, adding that it was just one of several moves the club has decided introducing to keep the players in high spirit ahead of several matches they will play. “We are confident of victory at home turf as the boys have assured us, supporters and well-wishers of their best performance. We will play our very own part to ensure they are well prepared to give the home fans the football entertainment and secure the maximum points,” he said. 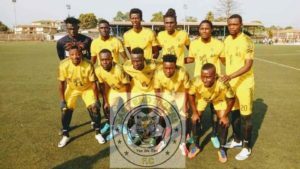 East End Tigers get-off a flying start in this year’s Sierra Leone Premier League campaign, thanks to 0-1 away victory over the Republic of Sierra Leone Armed Force (RSLAF) FC in Makeni.